Listen up! 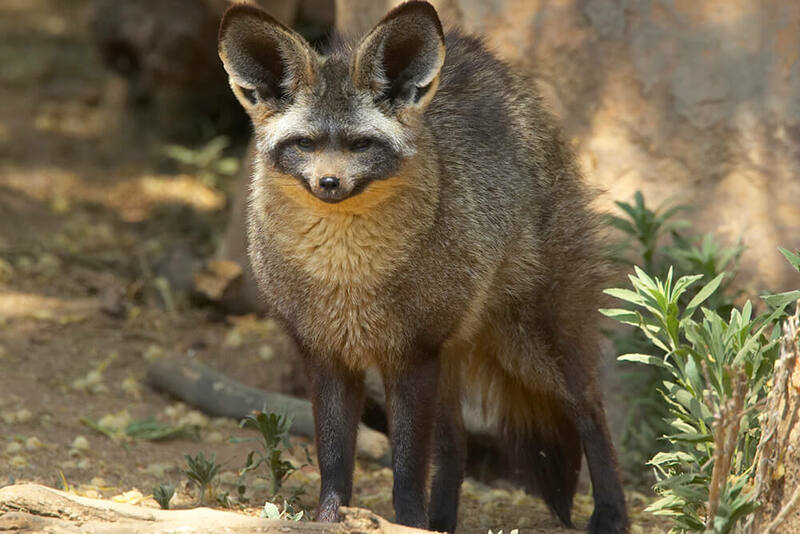 The bat-eared fox is a small, African fox known for its enormous ears, which are over 5 inches (13 centimeters) tall. The ears are full of blood vessels that shed heat and help keep the fox cool; they also give the animal a very good sense of hearing. Bat-eared foxes are sandy gray with lighter fur on the belly and darker fur around the eyes, muzzle, back of the ears, feet, and tip of its long, bushy tail. The inside of the ears and a band across the forehead are white or buff. Unlike other dog species, bat-eared foxes don't seem to mind sharing their territory. Up to 72 foxes have been recorded in 1 square mile (2.6 square kilometers). The scientific name for the bat-eared fox is Otocyon megalotis. It is from the Greek words “oto/Otis” (ear), “cyon” (dog), and “mega” (big)—and basically means eared dog with big ears. In the short-grass savannas and scrublands of eastern and southern Africa, it’s not unusual to find groups of bat-eared foxes occupying the same area, something uncommon among other wild dog species. Their wide habitat range matches that of their favorite food, the harvester termite. Bat-eared foxes usually live in groups of 2 to 5 individuals that have overlapping territories of almost 200 acres (80 hectares). Bat-eared fox kit peeking out of den. A bat-eared fox family has several den holes in its territory, each with many entrances, tunnels, and chambers. The foxes' claws are made for digging, and they can create their own burrow or enlarge an empty one made by another animal. They are even known to use old termite mounds as dens. The den is a protected area where the group sleeps and also where the females give birth. 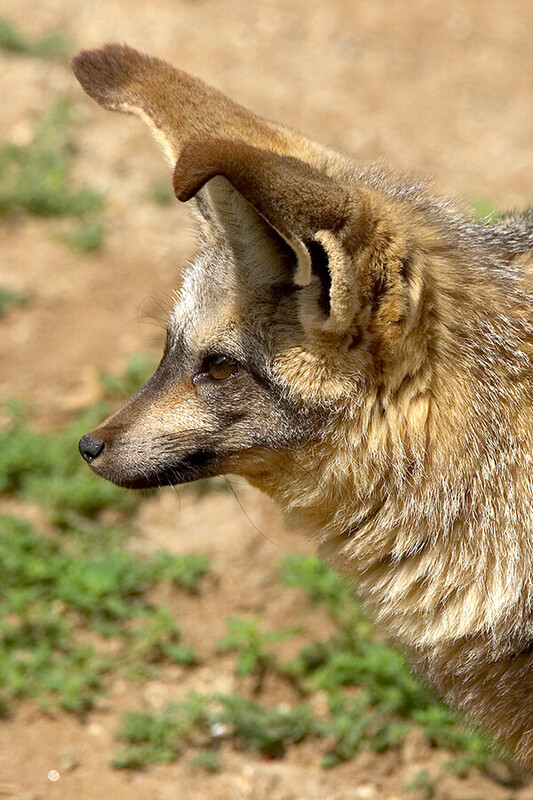 Animals that prey on bat-eared foxes include eagles, jackals, and hyenas. Yes, this fox eats insects, with termites making up to 70 percent of its diet. Besides termites, which it licks up from the ground, the bat-eared fox eats dung beetles and their larvae, grasshoppers, scorpions, spiders, millipedes, rodents, lizards, fruits, and eggs. But insects make up the main part of its diet. Bat-eared foxes have more teeth (46 to 50) than most mammals, and that's what sets them apart from other fox species. While other members of the dog family have two upper and three lower molars on each side of the mouth, bat-eared foxes have three upper and four lower molars. Specialized teeth chew their creeping, crawling food, and those huge ears can listen for insects moving around. Can you hear beetles crawling? Bat-eared foxes find prey by walking slowly with their nose close to the ground and ears cocked. Once they locate the insects by sound, the foxes jump or dig quickly to catch them and crunch them up for a tasty, high-protein meal. Bat-eared foxes hang around hoofed animals, because from those animals comes poop—and insects come buzzing around the droppings, providing a ready feast for the foxes. These little canids sometimes travel up to 7.5 miles (12 kilometers) each night when looking for food. Bat-eared foxes at the San Diego Zoo and San Diego Zoo Safari Park receive a fortified meat-based commercial carnivore diet, dog kibble, a small mouse, mealworms, and crickets. Keepers say mealworms are their favorite—like fox candy! In southern Africa, bat-eared foxes live in pairs along with any pups; in eastern Africa, a fox family may contain an adult male and up to three adult females with their pups. No matter where they live, all communicate with each other using their ears and tail; the foxes also use a variety of soft whistles. 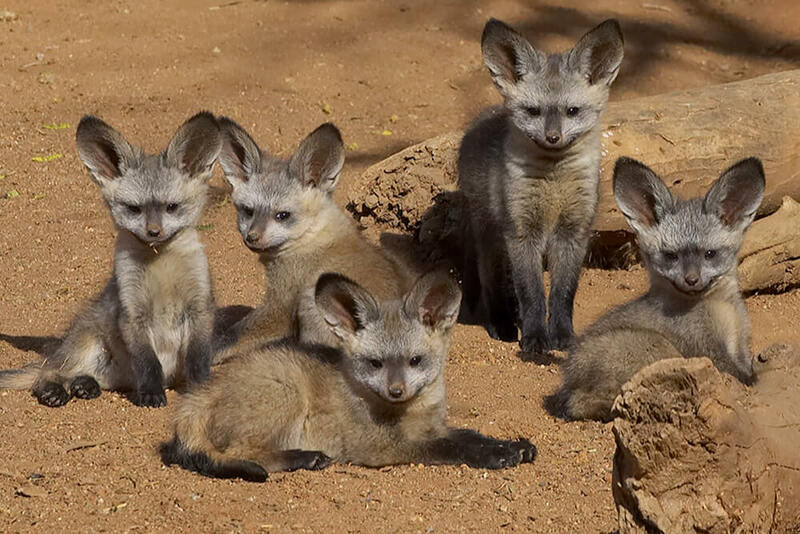 Bat-eared foxes have nine calls; seven of these are low-pitched, only meant for use within the group. Adults sometimes scent mark grass or bushes with their urine. In the rather extreme climate of their native land, bat-eared foxes spend high-temperature days in the relative comfort of their den, venturing out mostly in late afternoon to socialize. Around dusk, social grooming and play increase, and as dusk falls, the foxes leave the den area to look for food. Around midnight, they take a break to rest and then forage again until dawn. Back at the den site, they socialize and bask in the sun until it gets too hot, when they go back into the den once more. The foxes’ activity pattern is based on the activity level of the harvester termites. In eastern Africa, bat-eared foxes are most active at night; in southern Africa, they are nocturnal during the hot summer months and diurnal in the winter. When it comes to taking care of its youngest members, a bat-eared fox clan is a lesson in teamwork. The mother gives birth to up to six babies, called kits. About the size of domestic kittens, fox kits look a lot like Chihuahua pups but with much larger ears! The pups start to emerge from the den when 8 to 12 days old. Often, one or two of the smaller kits die in the first three weeks. The mother fox nurses her kits for 10 to 15 weeks, but unlike other canids, she rarely regurgitates solid food for them, as it would have a lot of hard insect parts that the kits could not digest. The father often brings food to the pups or watches them while the mother forages for her own food. He teaches his offspring how to forage, and he plays with them and grooms them, too. The young are fully grown by the time they're 6 months old, and females can reach their first breeding period at 18 months. A pair of warthogs share their enclosure with bat-eared foxes at the Safari Park. The San Diego Zoo’s first bat-eared foxes arrived in 1965. Since then, over 20 pups have been born at the San Diego Zoo Safari Park. Currently, the Safari Park’s fox family shares an enclosure with a pair of warthogs in the African Outpost, as the two species would be found in the same habitat in the wild. Fortunately, bat-eared foxes are fairly common in southern and eastern Africa. They are occasionally hunted for their pelts or killed because they are believed to be pests to young livestock. A male fox is called a dog, a female is a vixen, and babies are called kits or pups.